Hardcover, 9.5 x 10 in. / 112 pgs / 87 tritone. Essay by Henry Louis Gates, Jr. In 1990, Thomas Roma began photographing the exterior of houses of worship in his native Brooklyn, which features more churches per square mile than any other place in the United States. One morning, the pastor of an African-American Christian church housed in a former Jewish temple invited Roma to join the congregation with his camera, explaining that God's work was not in the buildings, but in what went on inside. 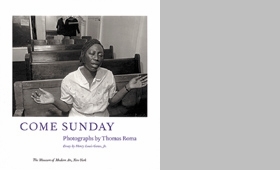 Roma eventually photographed more than 150 services in 52 African-American churches, richly fulfilling his desire "to make religious pictures for modern times." 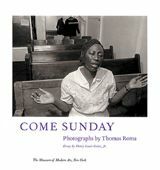 Only 100 copies of Come Sunday remain available, and each of these has been signed by the photographer himself. FORMAT: Hardcover, 9.5 x 10 in. / 112 pgs / 87 tritone.